Once you’ve made something from wood, whether it be furniture, floorboards or anything else, you need to coat it in a protective layer to ensure that it lasts without getting wet or becoming prone to bacteria growth. Using hemp oil for wood finishing is a popular choice because of the protection and resulting look. In this article we will be explaining what hemp oil is, the effects it has on wood, and why it is a worthy choice among other oils. Hemp oil is produced by pressing hemp seeds. In its freshly pressed form, it is a dark green colour and has a slightly grassy flavour to it. The oil is used in a range of products – most commonly for body care, where you will often see it within the ingredients of creams, soaps, and gels. It’s popular for this because of the high levels of omega-6 and omega-3 essential fatty acids, which are great for the skin, but also when used in industrial applications. You’ll also see hemp oil being used in lubricants, paints and plastics. Now, it is often used as a wood finishing oil. Why Does Wood Need to be Finished? If left in its natural state, wood would soon absorb moisture and become a breeding ground for bacteria and, as a result, provide very short lasting integrity for your furniture, fences and construction projects. To counteract this problem a coating is added known as finishing. The aims of the finish are primarily to seal the wood to protect it from the aforementioned issues, as well as making it a lot easier to clean, much nicer to look at, and to make it feel smoother. Evaporative Finish – This is the type of finish you will typically get with wax based products. To apply the wax it is mixed with turpentine or petroleum, but these will evaporate to leave you with a waxy residue that coats the wood. Coalescing Finish – These are usually water based and simply dry onto the wood. Reactive Finish – This type of finish is one that chemically changes during the curing process to provide the protection. Varnishes and oils are used with these products, often mixed with a solvent like white spirit, and it’s the type of finish that hemp oil is used with (although hemp oil doesn’t need to be mixed with a solvent). Each finish will protect the wood, but it also has a significant impact on the way that it will look. By mixing different types together you can achieve a wide range of effects from shiny to dull, and colours from pale to yellow to brown. The finish you use is, therefore, a crucial choice to make in the final stages of a woodwork project. What’s Special about Hemp Oil for wood finishing? Hemp oil gives a great final look to wood, and can actually have a restorative effect on furniture that is looking rather worn. It is a drying oil, which means it hardens into a solid film when left exposed to air, so provides a physical protection to the wood. It can be used on its own, or mixed with other finishes, and is simple and safe to apply. The process of extracting the oil means that you don’t have to use a product that has been mixed with any other chemicals. It’s completely safe to handle and is a 100% natural product. It’s a great way to finish wooden frames as well. You can use hemp oil for wood floors directly or you can put it on top of a porous paint layer. Let it soak through to the wood so that it adds a layer of protection. It’s a great way to liven up surfaces that look a bit flat, essentially treating painted wood in the same way as it does to your skin while adding protection at the same time. Hemp oil is, therefore, a great choice to use on brand new floors or furniture, or older ones that need sprucing up. It re-invigorates the surface and leaves a lovely sheen to it. If you are using pure hemp oil, you can also use it to treat the wood in your kitchen like cutting boards, wooden spoons, and countertops- because pure hemp oil is food grade and completely safe if it were to be ingested, unlike other finishes that are available. When you’ve gone through all the effort of getting beautiful wooden floors or furniture, it’s important that you protect it against moisture and damage so it lasts much longer. There’s a wide range of different finishes that are available to do this, each with its own advantages. 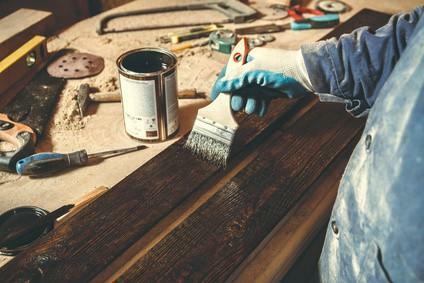 Using hemp oil for wood finishing, though, is becoming far more common because of its ease of use, safety, effectiveness and, most importantly, the way that the finished product ends up looking.